Indigenous accessory designer Helen Oro has chutzpah. She sidestepped the traditional craft and powwow markets to promote her flamboyant beadwork on the international stage. And what she found there is a world of opportunity in a fashion scene virtually untapped by First Nation designers. Oro’s Helen Oro Designs (H.O.D.) features non-traditional wearable art accessories such as her statement sunglasses that come with dangling chains and bold, colourful beadwork perched atop the frame. “They’re for stars to wear at fancy events, like hip-hop artists on the red carpet.” Her statement neck and face pieces proudly command attention while her “regular” sunglasses with colourfully beaded temples are a popular item for anyone wanting to rock a cool Indigenous vibe. “I want to touch a market that’s not been touched yet,” says Oro, a graduate of Praxis School of Entrepreneurship in Saskatoon. “I want to touch the mainstream fashion scene.” All indicators suggest she’s beginning to do just that. Oro is a member of the Pelican Lake Cree First Nation, located on the shores of Chitek Lake about 270 km northwest of Saskatoon. But she grew up with her grandmother in Saskatoon and attended Pleasant Hill elementary school in the city’s west end, circumstances that contributed significantly to her creative career. “My Kokum (grandmother) made moccasins and did beadwork, and it was a good experience watching her create and sell and provide for me as a kid.” Oro participated in an Indigenous dance troupe at Pleasant Hill school and looks back with fondness at the other “amazing programming” the school offered to Indigenous kids growing up in that part of the city. In fact, she didn’t realize just how fortunate she had been until she moved away from Saskatoon and attended high school in a small town not far from her First Nation. “They had no cultural programming. I just kind of lost touch with it.” Following high school, Oro enrolled in an esthetician course in Prince Albert as well as a part-time course in continuing care at a nearby town. She frequently travelled three hours a day to attend classes, often taking her baby with her because she was short on childcare alternatives. 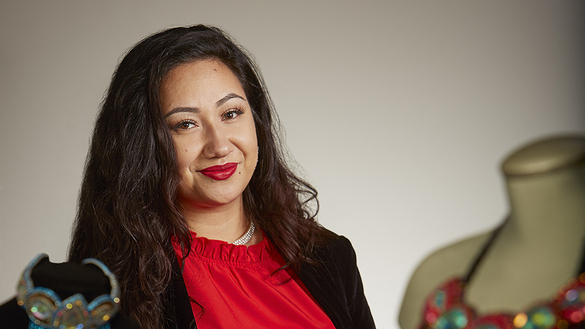 Before graduating from the esthetician course and after meeting the necessary legal requirements, she launched a seasonal nail art business at her First Nation. It was only after she had her second child and had moved back to Saskatoon that she began to pursue beading in a serious way. Today, she lives with her spouse and two kids, works from her home, and believes family and friends must come first to keep life and work in balance. Oro says beading has deeper meaning than some might expect. “It’s a form of prayer, and it also teaches you patience.” She’s quick to point out, however, that her beading style is decidedly non-traditional and that she’s careful not to copy patterns or designs used by other tribes. In Saskatchewan, Oro’s designs are available at the SASK Shop in Saskatoon’s Centre Mall.